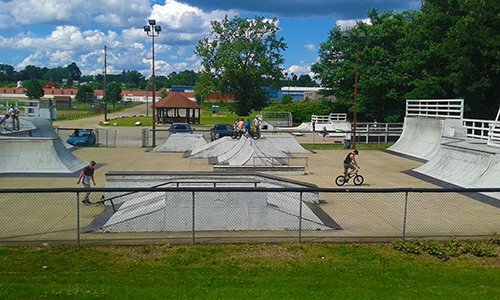 18,000 square foot park designed and built by Suburban Rails Inc. of Athens, Ohio, at a cost of $100.000. Directions Across from New Towne Mall in Water Work Park. Awesome and huge. 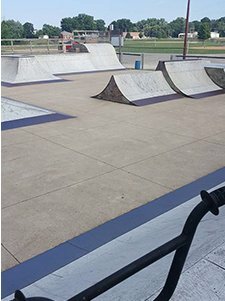 This park has it all, outdoors, wooden, BMX section separate from a smaller skate section, both equally fun. 5 1/2 quarters everywhere, metal coping, rhythm section, 6-ft spine, 10-ft vert wall. Roll in, huge fun box w/ 2 ledges and flat rail, sweet peninsula, and an even funner hip. 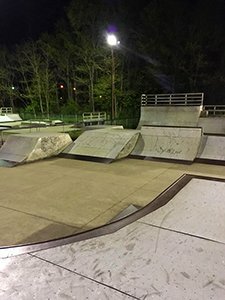 The little section has micro-minni and a fun box, with ankle, knee, and waist high grind boxes, free, lights stay on 'till 10:45.